Born into a family of artists, Francia was a painter, goldsmith and engraver. Influenced by his father’s woodcarving, Francia became a master goldsmith as head of the guild in Bologna. His surname, Francia, was taken from his goldsmith master. He first trained as a painter under Francesco Cossa (1430 – 1485), of the School of Ferrara painters. 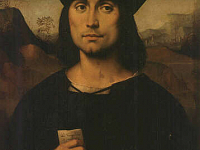 His principal training was with another School of Ferrara painter, the younger Lorenzo Costa (1460 – 1535). He collaborated with Costa some and his early work shows the influence of Ercole de’ Roberti (1451 – 1496), who was also a student of Francesco del Cossa. His first known paintings were the Felicini Madonna from 1494, the Calvary, and his Crucifixion, but he was by then an already established artist in his other skills. Some years later, Francia took up a position as a court painter in Mantua. In his works here he took his Ferrarese style and painted in the influence of the Umbrian artist, Pietro Perugino (1446 – 1524) and that of Raphael (1483 – 1520). This breadth of influence gained Francia a reputation as an artist with a diversity of style, unmatched in his time. He painted several altarpieces throughout Bologna and also in Parma, Modena, Ferrara and Lucca. Many of these depicted the Virgin with saints and were, like many of his works, gentle in nature, with an uplifting, peaceful harmony of composition. He was also a well regarded portrait painter, with works such as Portrait of Federigo Gonzaga, now in the Metropolitan Museum of Art, New York and his Portrait of Evangelista Scappi, now in the Uffizi Gallery, Florence. As written by the biographer Giorgio Vasari (1511 – 1574), Francia was an intensely emotional artist who died in a Melancholy state having seen, and feeling inferior to Raphael’s masterful work, Santa Cecilia. Francia had also painted two works of St. Cecilia, one of her marriage and the other of her burial. Whether this is true is left open to the many accounts that Vasari took creative license with to tell the history of the Renaissance. Before Francia died he trained both his sons, Giacomo and Giulio to be painters.